Seventeen contracts were signed last week at $4 million and above, a disappointing total for the prime selling season of the year. 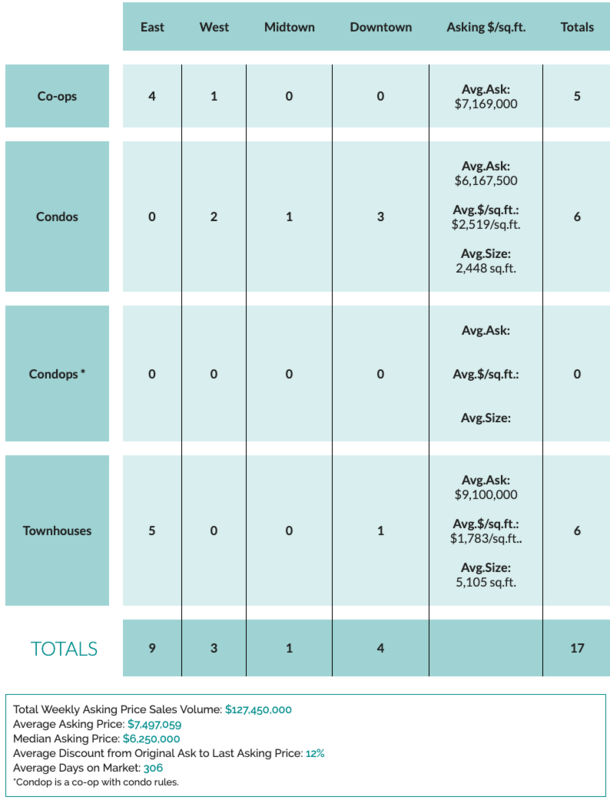 Stat Geek Alert: Only 3 condos were sold by developers, and of the 6 townhouses that went to contract, five were in the East 70s and 80s between Lexington and Park Avenues—and averaged under $10 million. The No. 1 contract was PH905 at 1 West 67th Street, asking $11.995 million, reduced from $19 million when it was listed in June 2017. This triplex co-op has 4 bedrooms, 5 bathrooms, 3 powder rooms, and a 55-foot great room with over 18-foot ceilings. The top-floor master suite is surrounded by an 827-square-foot terrace. The unit is in the Hotel des Artistes, which was designed in 1917 and gained popularity with artists and actors. Amenities include doormen, a swimming pool, two workout rooms, squash court, roof garden, and the Leopard at Des Artistes restaurant. The No. 2 contract was a townhouse at 182 East 75th Street, asking $11.5 million, reduced by $495,000 when it went on the market in March 2018. The 4-story, 18-foot-wide house has 5,850 square feet including 5 bedrooms, 6 bathrooms, a powder room, and an elevator. It was purchased for $9.28 million in May 2015 and then renovated.